Some people think best abs exercise with a stability ball is oblique roll-ins. Oblique roll-ins are a great ab exercise with the stability ball, and below are pictures and instructions for this exercise. Starting Position: Begin by placing your feet on a stability ball, and your hands on the floor. Your hands should be directly underneath your shoulders. 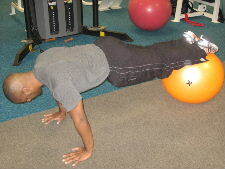 Personal Trainer Tips: With this exercise you must be mindful of the position of your lower back. When your legs are straight, make sure that you engage your abs so that your lower back doesn't arch excessively. When you first try this exercise, you may find that the ball has a tendency to roll from underneath you. Only move as far as you can control with good form. If you are a beginner, you can build up your strength with regular straight roll-ins or start by holding the plank with your feet on the ball. 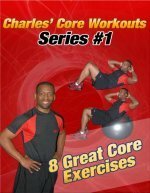 If you don't have access to a stability ball, try another exercise from the Picture Directory of the Best Abs Exercise, and remember to listen to your body and have fun working out.